The hW Master Additive Package is exclusively found at BRS. 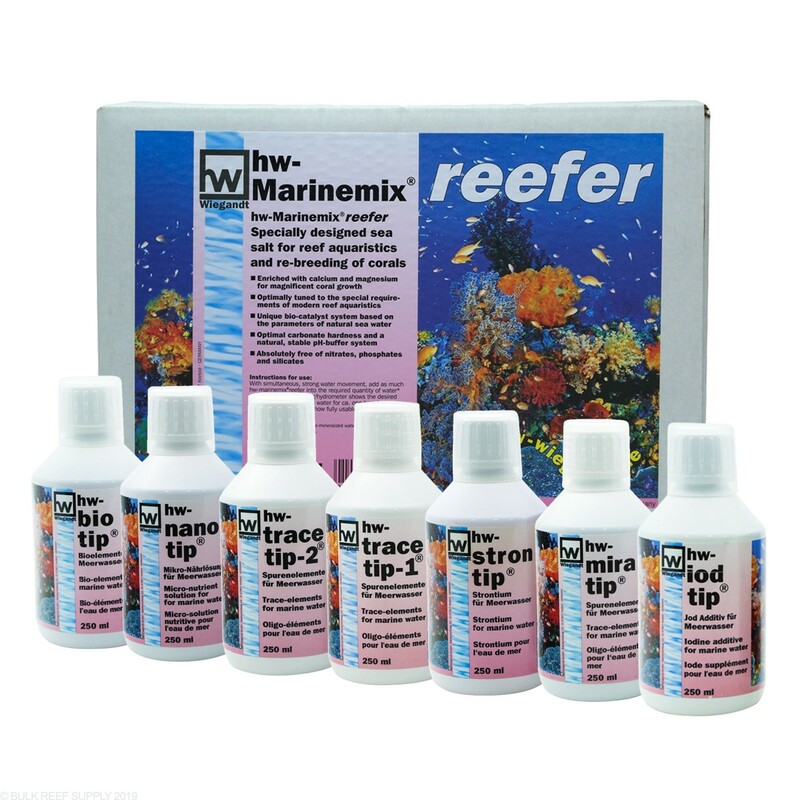 Bulk Reef Supply has compiled a package of the most popular and useful HW additives all in a single package for a successful growing, colorful reef tank. From salt to minor trace elements, all that is needed for a complete trace element system is your choice of 2 part solution. Since its founding in the year 1959, Wiegandt GmbH has been a true family owned and operated company. Wiegandt GmbH was one of the first global companies in the industry to specialize in the in-house research, development and production of sea salt and other specialty products for the field of saltwater aquarists. hw biotip is made of amino acids and vitamins which provides the basic elements for coral tissue and coloration. hw nanotip is a specially formulated soltuion containing dissolved nutrients, micro nutrients and amino acids. hw tracetip 2 contains high purity trace elements for the growth and coloration of your reef tank. Use alone or with hw tracetip 1 for faster absorption of trace elements. hw tracetip 1 contains high purity trace elements for the growth and coloration of your reef tank. Use alone or with hw tracetip 2 for faster absorption of trace elements. HW-Marinemix Reefer Salt Mix is a high purity blend of salt mix produced using a synthetic process and does not contain any recycled components. Created specifically for the reef aquarium and the constant demand for minerals, trace elements, amino acids and biocatalysts. Provides enhanced calcium and magnesium concentrations for vigorous growth of corals. I've been using HW salt and decided to try the additives as well. I can certainly tell a difference in coloration. I haven't been dosing long enough to speak to growth at this time. I have been using the recommended amounts and I understand the perception that we are dumping in elements that we don't completely know what they are; however, I believe that we are all doing this anyway with whatever salt you are using unless you are testing your salt mix and supplementing accordingly. This is why I believe that using the same brand salt and trace elements is better than mixing and matching brands. Only that single company truly knows what to put in the trace elements to compliment their salt or other products. I love her salt , but I like to test what I am adding to my tank. Other than the iodine and ston-tip I don't have a clue what the other bottles have in them. Please post a video on using this product in your weekly videos.for now I just buy the salt and use the other bottles as raffle prizes . Very happy with switching to this brand of salt and additives. I have noticed better growth and coloration in my LPS & SPS corals, especially in the blue colored ones. Salt mixes very well, with exceptional clarity. Have had no issues with overdosing on any of the additives. Water tests out well for all levels. I'm a Happy Reefer! The salt mixes clean and I will continue to use. The rest of the package I won't reorder. Outside of the stron-tip and iod-tip you don't know what your adding. Even with dropping down to 1/4 recommended dosage and eliminating iod-tip my iodine is too high. Was just a hair low before dosing with this kit, when it comes to iodine I would much rather be low than high. Stick to additives that tell you what your adding.